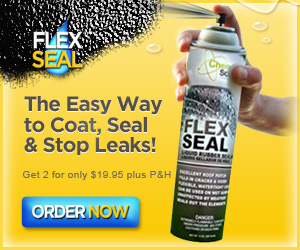 Flex Seal is the best way to stop leaks! It sprays out a special liquid that seeps into cracks and holes and dries to a watertight, flexible rubberized coating. It’s great for roofs, gutters, pipes, skylights and more. It’ll seal out water and last for years. Once it’s dried, it can be painted to any colors. Buy 1 Get 1 free! Take advantage of this offer today! Place an order today and they’ll add an extra flex seal can for free. Just pay shipping! If you have questions regarding an existing order, please contact the company directly. Monday through Friday, 5:00am to 5:00pm Eastern Time.